On one of Ketchikan’s rare sunny days this summer, a group of local residents gathered on the downtown cruise ship dock to board the Holland America ship Zaandam. 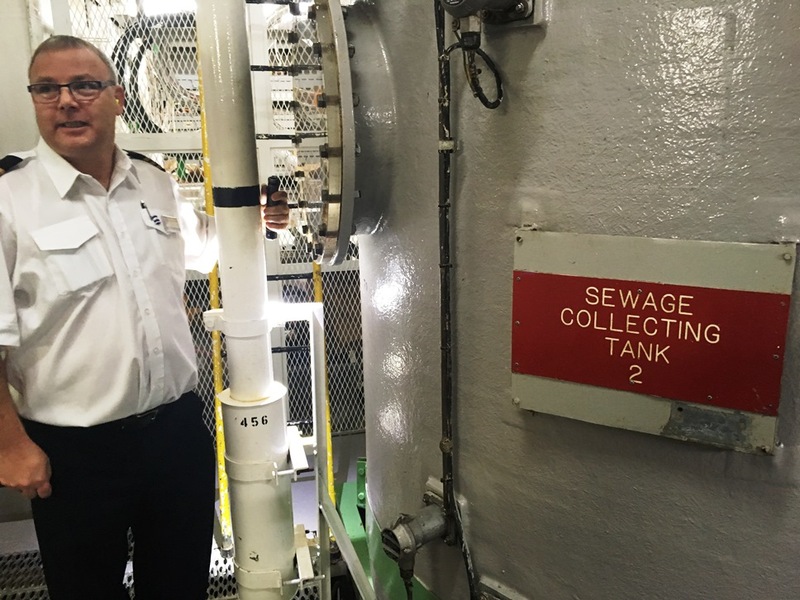 The group had a fancy lunch on board, and then took a tour of not-so-fancy areas that most people never see: wastewater treatment, emissions filtration and garbage sorting. After lunch, the group of Ketchikan business owners, elected officials, media and municipal employees watched a short video in one of the ship’s theaters. “Every week on average, a cruise ship carrying 1,700 guests will produce up to 60,000 gallons of sewage,” the video’s narrator said. It explained how much waste the floating cities produce, and what they do to manage it. “We have an environmental officer on each of our ships, who provides environmental training and overseas shipboard compliance with environmental laws, regulations, industry standards and company policies,” the video continued. Adrian Daniels is the Zaandam’s environmental officer. After the video, he took the tour through a door where opulence ends, and utility begins. Gone was the lush carpet, replaced with a painted metal floor. He walked up to a door with a key-card lock. 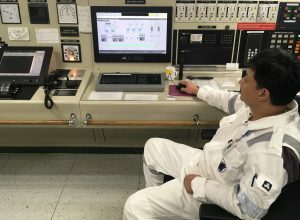 About 95 percent of the ship’s automated systems are controlled from here, with three people minimum on watch at all times. Alexies Varon is the senior watchkeeper and is in charge of the ship’s wastewater plant. “All the black water and gray water that comes from the cabins – is pumped by the jet pumps,” Varon said. Blackwater is anything flushed in a toilet. Graywater is pretty much everything else – whatever goes down a sink or shower drain, for example. Varon explained that the Zenon-brand wastewater system mixes those, and treats both the same. The water is sent into a filtration system to separate solids. The liquid is sent into a bioreactor and membrane filtration system to further filter impurities. Then, there’s a final step. 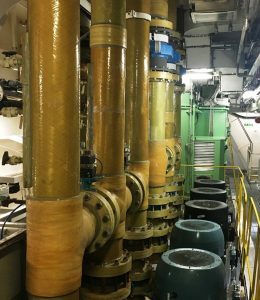 The Zaandam, with its advanced wastewater treatment system, is one of the ships the state allows to discharge continuously, including when it’s docked next to a community. A local resident asked Daniels what is discharged in port. “We discharge permeate,” Daniels said. Daniels said that testing looks at levels of bacteria and dissolved metals. He said they meet international, federal and state regulations for discharge. And, he said, the permeate meets standards for drinking water. “That may be the case for human drinking water standards. But they may be releasing concentrated levels of metals that are completely intolerable to baby salmon, for example,” Michelle Ridgway said. She’s a marine ecologist who grew up in Ketchikan and now lives in Juneau – two of the largest cruise ship towns along Alaska’s Inside Passage. Ridgway also was a member of the state cruise ship science and technical panel. In that role, she examined state regulations governing cruise waste and emissions, and procedures ships use to manage it. While the science panel as a whole signed off on the state’s cruise ship wastewater regulations as adequate for marine life, Ridgway is concerned about discharge near shore and in port, even when the water is clear. The science panel’s report notes that the state’s criteria for copper if 3.1 parts per billion. Cruise ships like the Zaandam are subject to state testing in addition to other tests. But, Ridgway said even a little bit of copper can harm a salmon’s sense of smell. And they use smell to find their way back to the correct stream for spawning. “We certainly know how much we like our king salmon. I don’t know about some areas in Southeast, but in the north area, we have seen a major decline in king salmon recently,” Ridgway said. Ridgway said other marine animals are affected by dissolved metals. Krill is one example, and that’s an important food source for many ocean creatures, including whales. Ridgway also questions how effective the systems are at removing tiny particles such as viruses and pharmaceutical residue. So, what should the ships do to reduce their impact? Ridgway suggests cutting back on the amount of water used, along with continuing to improve on-board treatment systems. That includes more controls on temperature and acidity of wastewater, to make sure ships aren’t adding to ocean acidification or warming waters. Ridgway said she’s definitely not anti-cruise ship. But, Ridgway said the cruise industry needs to do everything it can to maintain the wild Alaska that its customers come to see. The cruise lines, at least according to the video, seem to recognize that, as well.